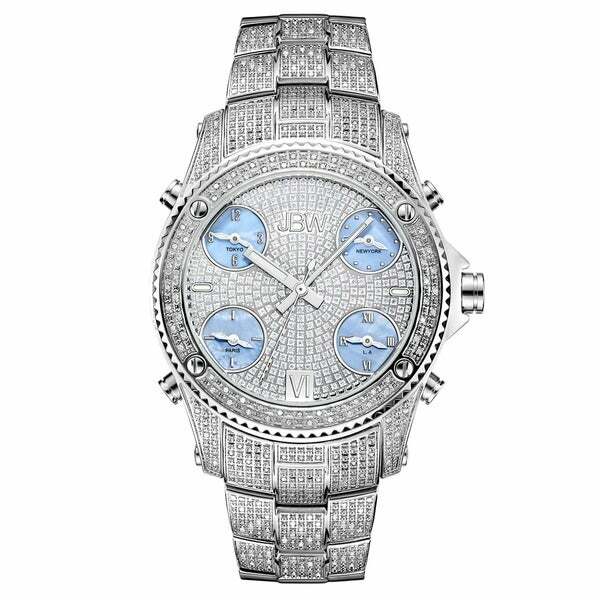 This sophisticated men's 'Jet Setter' diamond watch from JBW features a stainless steel case with a matching bracelet. The crystal accented dial sets the stage for silvertone luminescent hands and Roman numerals for easy time-telling. This is a beautiful watch. I bought this for myself for Christmas. My wife loves this watch. Thank you for bringing such great deals to your customers. I recommend this watch to anyone. I love this watch! I always get so many compliments, when I am wearing this watch. People always ask me about it. It's big watch and on the heavy side, but it sparkles and shines. So if you like that bling look, this is the watch for you! I personally love this watch. Yes it is big but it's a definitive attention getter. That's what I wanted and this watch delivers. If you notice from most of the reviews, they usually range from 1 to 5. You are either going to love it or think it is some kind of novelty joke and want to return it. If you are on the fence at first, do what I did and go to someplace like J.C. Penney and try it on first. Don't buy it there though, you'll pay well over $700.00 (on sale!). I got mine for just a few bucks over $400.00 on Overstock. With this watch, big hands, wrists and forearms are a definitive plus. If you're anything like me and big guy... own it, flaunt it and enjoy the attention. I didn't expect that it's a real diamond, I tested it and the watch is very nice. Not as glitzy as pictured, which isn't a bad thing. It just didn't have that rich wow factor. Has a cheap look to it. Had it appraised when I had the bracelet sized. It's true to original value. The watch arrived packaged very well, along with its own personal serial number, 2-year warranty (after online regist. ), and a magnificent shine to accompany my style. "The first and fourth pictures don't even look like they are the same watch. I would like someone who owns the watch to tell me which one is more similar to what it actually looks like. Thanks." "I have a large wrist what if I need a few extra links. How much are they?" "What is the return policy. Would liek to try it on and see if I like it but there is no store that carries it." "what is total diamond ct?" Hello ddancy, the diamond weight is approximately 3.0 carats. Please let us know if you have additional questions. Thanks for shopping with us.